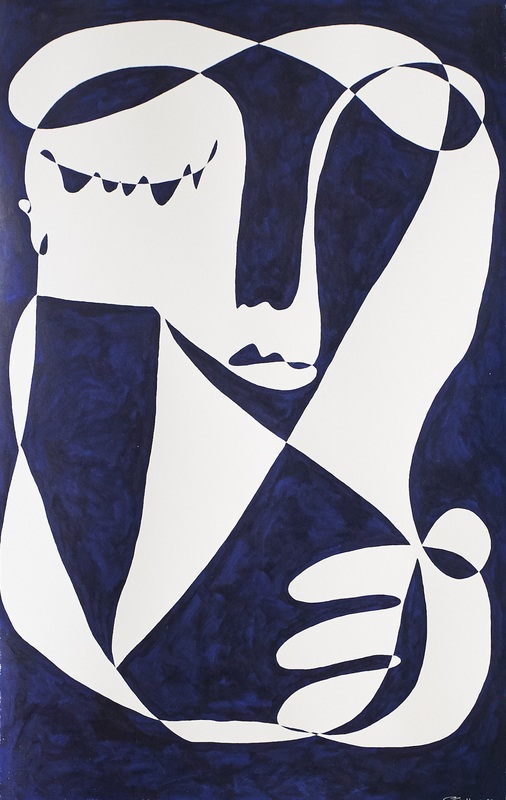 Copenhagen-based artist Christiane Spangsberg doesn’t believe in second attempts. 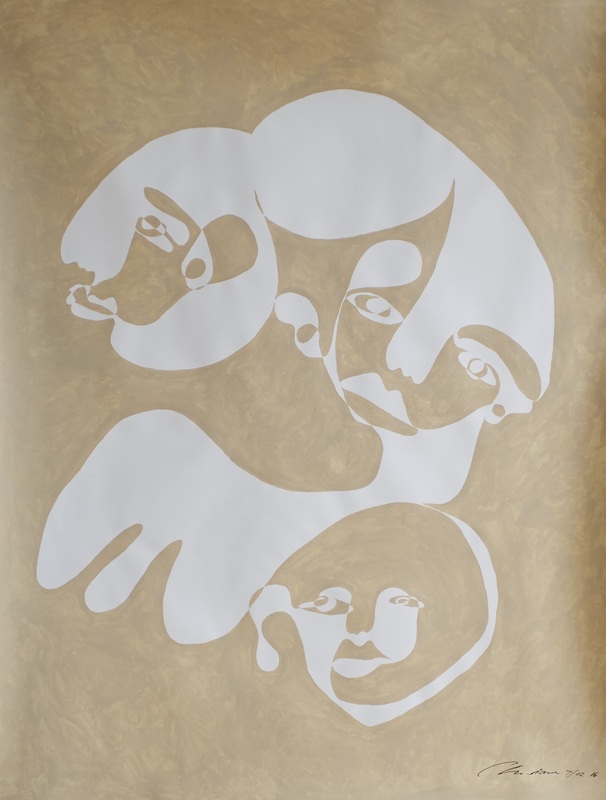 Wholly focusing on notions of immediacy and authenticity, she relies heavily on her own intuition, not too different from Exquisite Corpse games drawn from the Surrealist tradition; but as evidenced by her works, there are clear echoes from various strains of Modernism mostly forgotten. Her lines and solid brushstrokes veer and pivot quickly but naturally so, and while the lines maintain tension throughout, they ease on into a serene whole, creating an almost too-perfect metaphor for her upcoming show “In a Crowded Place” in New York’s Parasol @ Bowery Gallery, starting 15th of June until Sunday the 18th. Much like the exhibition title, Spangsberg reinterprets her nervous experiences in crowds, where sentiments quickly turn from alienation to existential crises to immediate relief at the beginnings of relatability — perhaps analogous to how fraught a genuine encounter actually is. But just like her paintings, Spangsberg irons out the kinks with a swift brush stroke and simplifies it down for easy, soothing viewing. Read on as she poetically details her background, her love-hate relationship with Instagram-worthy works, along with her own anxieties about being in a crowd; moreover, she lets Teeth in on a secret reveal of her latest project, so read on to see what else Spangsberg is up to. How has your background influenced your painting? It’s interesting talking about yourself having a particular background. Anywhere you are in life is because of a background. The question “how” is also interesting, ’cause how can I possibly know? It is me. It is who I am and what accidentally (or perhaps not so accidentally) happened because of this exact reason. But to be more clear, I have always spent a lot of time by myself being an only child. I have thought a lot. I have occupied myself and created new worlds. I have thought about things other people don’t have time to think about. I used drawing as a medium to keep myself occupied — to have a place to channel my thoughts. Thinking and philosophising is a part of my nature as a being; I can’t control it, and I can’t stop it. But I can channel it somewhere. I can make themes and communicate it through the medium I do. It just makes more sense now than it did before. But in twenty years we can talk about this exact time as my background and who knows how it has influenced me? It’s difficult to say. When did you know you wanted to be an artist professionally? I read on your site that you wanted to pursue developmental technology and the philosophy of IT. Can you explain a bit more about that? I like the dichotomies of your paintings as this remarkably freewheeling creativity paired with tech! I had no idea what I wanted to be. First I thought I wanted to be a teacher, but I was kicked out of that school because I didn’t go to class (it was just so boring). Then I moved to France and lived in the Alps for some months, and there I got a lot of friends from Copenhagen. They convinced me to move there. I had no idea what to do, but I knew I had to study something. I asked my longtime friend Freya Dalsjø who was living in Belgium (Antwerpen), at that point where she went to design school, about what I should study. She told me she could see me studying Performance Design. This was where everything started. I had no idea I would end up being so fascinated by technology. Life always twists and turns. I think my mom is very happy with the fact that I have a degree in something. Being an artist was not part of any plan. And who knows if I am an artist or not. Think I’ll have to die first before we really know. 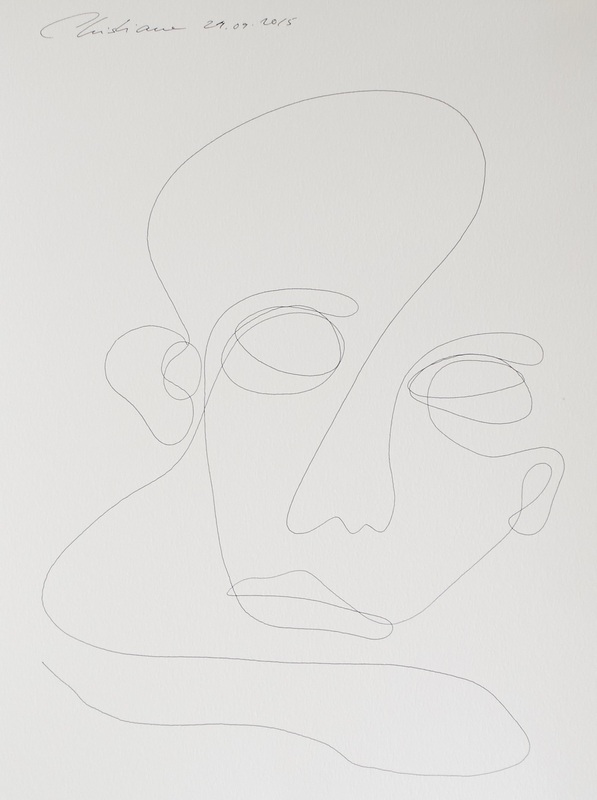 When you start a piece of work, do you know whether or not it will either be a line painting or filled out more? Or does it happen more organically? What is your creative process like? I always know what kind of drawing I will make by the materials that I use. It’s different processes. With the one-line works, I only use a pen. I believe in the first attempt. I don’t do steps in terms of sketching or using charcoal first. I believe in the intuitive piece as the most authentic and honest one. The same is for the blue, even though it’s a different process. Either way, it’s not that I have any idea of the image of the work. Each piece happens hundred percent organically. Do you think your drawings have changed at all since the inception of your professional career? I believe that myself and my work is in constant change. It is what I strive for; I always strive for better. To know more and learn new things, never to settle. That scares me. The feeling of being in limbo and not moving anywhere. How has Instagram changed the way you work, if at all? Does it feed into your work directly (be it the pressure of a post and/or serving as a moodboard)? In the beginning, I was very unsure about how I should use Instagram. It was a mix of my friends and then my personal work. I tried as much as I could to keep myself out of it cause it felt vulnerable to be “out there”. But after struggling with all of this for a while, I remember I made up my mind to be visible. To actually be “out there”. To be vulnerable and share my thoughts. I felt I couldn’t do anything else than actually be honest and upfront about what I do. I’m rarely on my phone when I’m with people, and I don’t have a feeling that I have to post anything. I post when I post and say what I want to say. I don’t think ahead and try to force anything. I guess you can see it in my feed too — it’s not perfectly curated, but somehow it fits together because it’s all my work (or me, haha). I’m very spontaneous, as the way I like to live. But you are right in the way that it actually sparks something in me creatively. Being able to show your work, and the fact that people like it, only makes me want to push myself more — to challenge the people who follow me. The thing I’m most aware of is that I don’t want to be a trend, and I need to push myself every day to do the best I can. I need to take risks pursuing new directions. I noticed that you’re around various bodies of water on your Instagram! I can’t but help make the comparison of fluidity IRL onto your actual drawings. Can you speak to water as an inspiration in any way? The ocean calms me. It makes me feel free. You can breathe by the water, and in so many ways it inspires me. I go to the water to think, to get new perspectives, but I don’t use the water in an objective way when I then create a piece of work. But what I feel by the water I bring back into it [the work]. I’m really excited to see your show “In a Crowded Place,” which is particularly fitting for NYC. How did that come about? New York has always been kind of magical to me. I had only visited the city once in 2015. It was winter and extremely cold, but the city still made its mark on me. I felt the energy. The people. And ever since, I’ve wanted to go back. New York is also where I first had a lot of attention from collectors. I knew this was where I wanted to have one of my first shows. I like that the idea of being in a crowd is both an overwhelming and exciting experience for you. Do you have a specific personal anecdote that inspired you for this project? I have always been nervous in larger crowds. It overwhelms me, and I want to escape into a corner. And I’ve come to wonder why I get scared. I’m not scared in a way that I think anything will happen. But it’s the overwhelming feeling that gets me, a sense of losing control. But then if I take a moment and see the people around me, see how they behave, how some are in their own little worlds too, then I can calm myself. I can relate. I hope the blue pieces will remind you of the people you see. The people who stand out in the crowd. You see their differences, perhaps their similarities. You might judge them, and they might look at you looking at them, and your eyes meet, and for a moment, you are both out of your bubbles. You might smile. You might just look and realise the person in the crowd was real too. But then there are the people in the background. The ones you don’t notice. They are fading away, not because of a particular personality, but because you see the world from your perspective. The ones in the background are as much the people you notice – the different ones. If you were there, you would notice. That’s how our perception constantly changes. With the blue works, I tried to capture the feeling of being in a bubble. That we are all occupied, in our own world “sphere”, perhaps some, like me, can feel alone, surrounded by people. And I want to remind myself that we are never alone, maybe we are just too far away in our mind to realise the present. I don’t want to say much more, but I’ll let you see the exhibition and tell your story from there. Speaking of which, are there any city crowds you prefer? Cities you don’t particularly like? What cities do you visit to get away versus cities you find productive? That’s an interesting question. All cities are different, and all have their own identity and feeling in a way. Every city inspires me. There are some I feel more pressure and discomfort than others, for example, Bangkok. People walk very close to you, and it’s hard for me to keep an individual space. I get so occupied with this that I close myself off from the people I’m around, along with the people I know. But the thing is I love to experience new cities. I would love to go to Tokyo, and I know this is embarrassing, but I have never been to Paris either. I’m dying to go to so many places. What else has been inspiring you these days? Well, I actually have a secret I haven’t told anyone yet. I have been chosen in Denmark to do a campaign for cancer research to raise money and communicate the relationship between generations when a relative gets breast cancer. It will end with an exhibition in Copenhagen in October 2017 where a lot of the sales will go to charity. It has made me think so much about life. How we communicate, what we say, and what we keep to ourselves. How we communicate our fears. How we can lose ourselves to something which not necessarily is death. But losing the person that we knew we were. After the exhibition in NY, I will tell everyone more because I can’t do this by myself. I need everyone’s help. I hope people who have experienced this type of loss will share their feelings and thoughts with me. This is the only way I can feel it on my own body and communicate the campaign. I’m nervous though. Very nervous. Oh, wow! Will you be doing research via your own artworks? I not only see the project as research through a process but also a chance to talk about what is most difficult in life: death. Losing the ones you love the most. To tell the stories of the ones who have lost relatives to cancer. To share the feeling of losing oneself, and the person you know, the minute you get the news about your disease. I feel very humble, and I want to treat this subject with the utmost respect. The Danish Cancer Society contacted me, and every year, they run a campaign to fund breast cancer prevention research. The campaign is called (in Danish) “Støt Brysterne”. The meaning of it is kind of like “donate for the breasts”. The people who contacted me run the campaign and wanted to have me as the front person of the campaign. They were very open and told me they wouldn’t restrict me in any way. I will work on the campaign during summer. It is very important for me to do as much as I can to understand the subject I am talking about. I will be talking to a psychologist, to families, and I hope some will share their stories with me on email. The campaign will end in an exhibition where I will donate half of the money of the original works sold to research. Additionally, there will be a poster made where all the money will be donated to research. Are you drawing anything else outside of your typical style that you simply don’t showcase? I most often share everything I do. I do not show things which I’m not sure of myself. Some pieces I have in a pile, and I still haven’t decided if I like it or not. 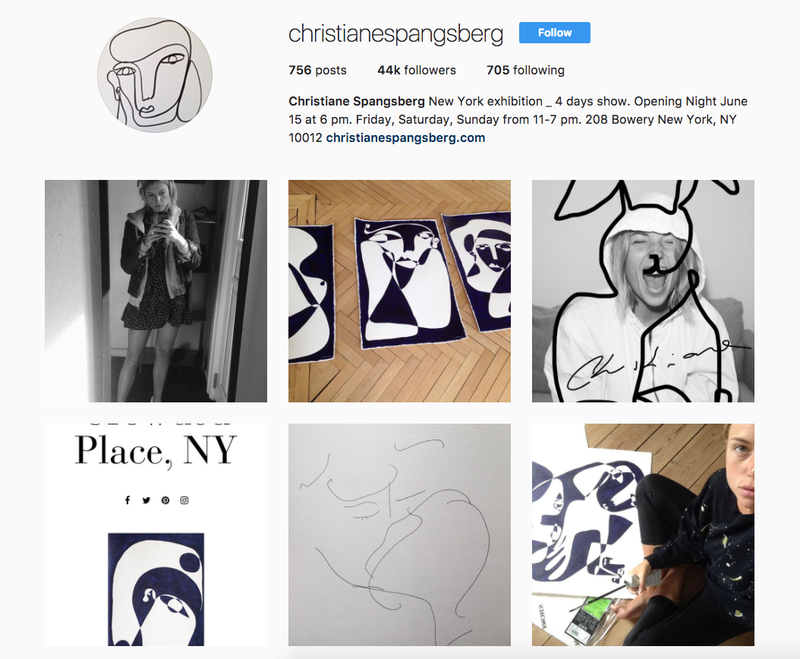 Follow Christiane and her artwork through her Instagram @christianespangsberg or via her website.